Announcements, Upcoming & Special Events, See below. When we post something new we will put the date of the posting here so you will know to scroll down to find and see it. Important upcoming dates: Details below, on the website and FB. Pace: D category ride (Avg. 12 to 14 mph) Note: Likely a fast "E” to slow “D” pace for the first 50 miles. Description: This will be a century to remember. Most likely we will break into groups with a few predetermined regrouping points. It will be 50 miles gradual uphill to start and a fast 50 miles downhill coming home. Over all we should average in the 12 to 14 mph range with a goal of doing total elapsed time of 8 hours or less. Support: This is a self-supported century, so come prepared to feed and water yourself. The route will take you by places to do this but it is your responsibility. Additional Information: The route and any updated information will be posted on the Sun City facebook page and web-site and the SWBCC facebook page and event calendar. Watch for updates. RSVP: If you are planning on going please RSVP to Warren Smock at warsmockren@hotmail.com by March 15, 2019. 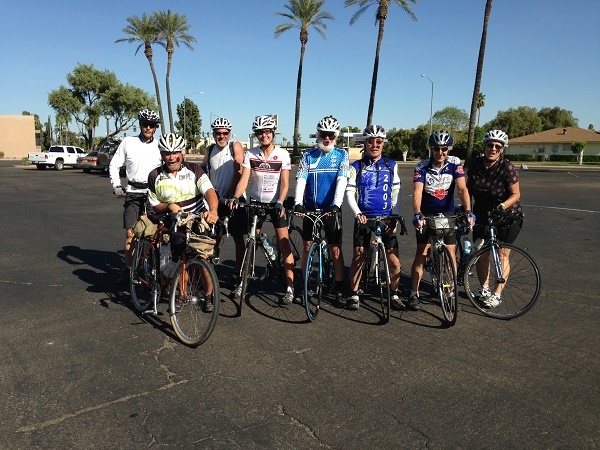 Sun City Cycling Club is a chapter of the Arizona Bicycle Club and if you ride with us you are encouraged to join. ABC web site is www.azbikeclub.com . Click on Chapters icon and then click on Sun City Chapter. (Note, use your desktop computer as the phone for some reason doesn’t seem to update.) You can also follow us on Facebook. Search for Sun City Cycling group and ask to join. 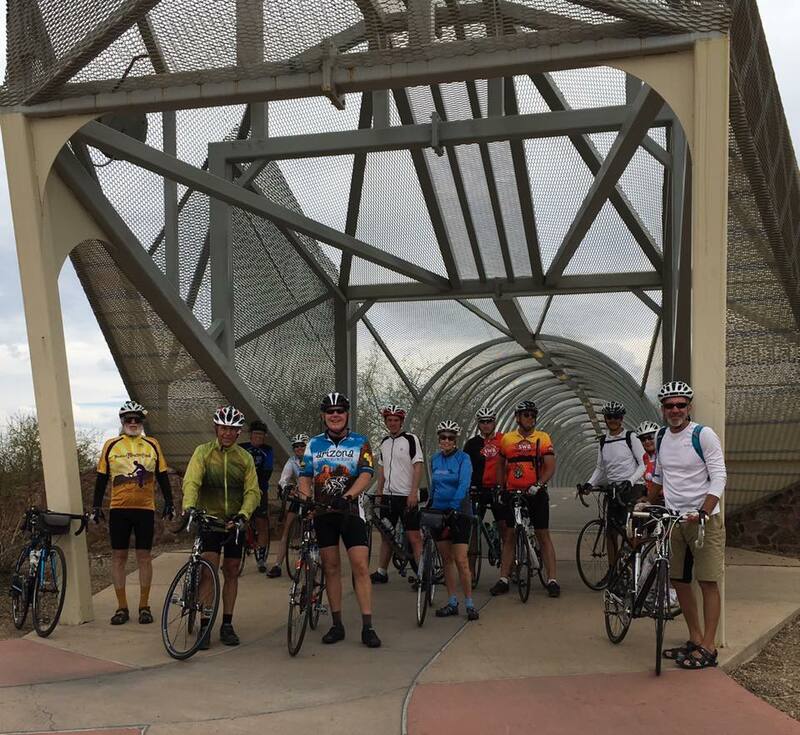 Sun City Cycling Club’s mission is to provide Sun City residents and neighbors an opportunity to enjoy the comradery of group bicycling. We ride every Tuesday and Thursday mostly starting at the Sundial Recreation Center by the Sun Dial. Usually on the first Thursday of the month the Thursday rides will have an alternative starting location. 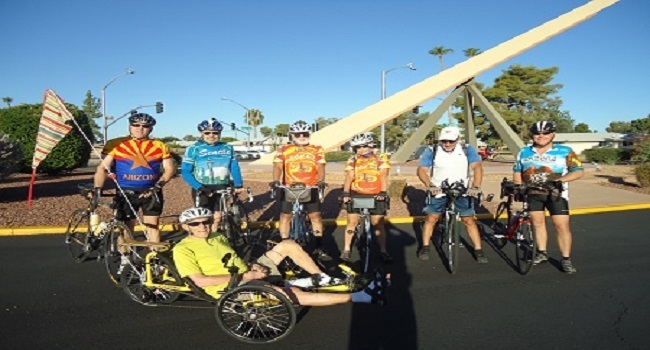 We ride every Tuesday and Thursday and meet by the Sun Dial at the Sundial Recreation center, corner of 103 Ave and Boswell in Sun City. Occasionally we do a ride on another day and it will be listed above in Upcoming Special Event. See starting time schedule below for normal start times. Tuesday Rides: Are casual rides within Sun City, the New River and Skunk Creek trails. Distance between 5 to 20 miles, no one will be dropped. These are slow pace generally cruiser type bikes and everyone is welcome. Requirements are Helmet, water and good attitude. Recommended are gloves and minor. Start times are listed below. Thursday Rides: Are a little more serious. We ride 35 - 50 miles at 14-15 mph. We usually meet by the Sun Dial at the Sundial Recreation Center in Sun City but occasionally start from alternative locations. Check the information above in the Upcoming Special Event section for more information if there is an alternative start location. Requirements are Helmet, water, safe and group riding practices and skills, a good attitude. Recommended are gloves and minor. Start times are listed below. Rain at the start location and surrounding area cancels the ride. Start times might change due to extreme weather conditions. Canceled rides and start time changes will be posted on this web site and on our FB page as soon as possible but could result in short notice. Join us for a fun and friendly ride. Updates and changes will be posted on our website, (see introduction) and Sun City Cycling Facebook page. Always check before you come to be sure something hasn’t changed. These three Sun City bicycling routes are North Route, Central Route and the South Route. All routes are within Sun City. Between the Central Route and the South Route use 103rd Ave. Between the Central Route and the North Route you can use either Boswell Ave or Burns Dr or Lindgren Ave. The following are some normal rides that the group does on their Thursday rides. 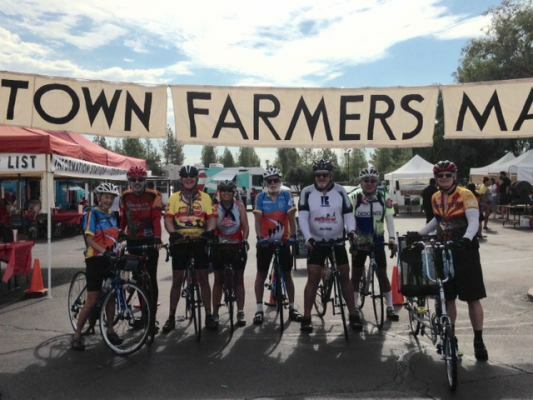 All routes may be modified during the ride depending on the weather and desires of the group. Most have at least one stop for restrooms and coffee/snacks. 1. The letter designations have absolutely no significance;they are just a way to easily identifyon Facebook or emailwhich ride we might be doing on any givenThursday. Example ride A is no more or less important thanride E.
2. The Ride with GPS link should take you to that route. If it doesn’t work you can go to Ride with GPS (http://ridewithgps.com) and do a search for SCCC rides. 3. I have adjustedthe cue sheets so they should match the courses, but be aware that you should at least have an overall idea of where you are going, etc. before heading out. 4. Mileages should be good unless notedotherwise. Inseveral places Ride with GPS doesn’t recognize some streets, trails or connectors that are used. These have been noted in the descriptions and also the cue sheets adjusted to keep you on the actual route. 6. More rides will be added as we develop more routes and longer routes. Description: Route to Karl's Bakery, Spoke and Wheel and various eating establishments via the AZ Canal Trail and back home by streets. Comments: The GPS map and the cue sheet do not match. Use the cue sheet. Description: Route going north to see the Mormon Temple and then over Thunderbird Park Hill and stop at Dunkin' Donuts. Mtn. and lake views along the route. Description: A nice lollipop ride to a real old western general store in Waddell, AZ. Nice views of the White Tank Mtn. and horse farms on the return trip.. Description: Sundial RC to Vistancia and then to an actual sundial. Route goes north to see the longhorn steer and a little hill work before heading west to Vistancia. Safeway foods and a couple of eating places are located in Vistancia. Comments: An alternative is to take the Discovery Trail from the sundial back to El Mirage Road and Safeway before heading back to Sun City. Description: A nice little tour through Sun City, Sun City West and Sun City Grand, but does not go out to Sun City Festival. Be aware that GPS doesn't recognize Deer Valley Connector at approx. 17.5 so course is 4 miles shorter than the Ride With GPS link and map shows. Cue sheet is correct. At intersections: You should be positioned in lane that will take you in the direction you plan to go when departing the intersection. If there is a right or left turn lane and you are going straight, you should be in the lane that goes straight. Often there is no right turn lane, stop in the middle of the straight lane to allow cars which want to make a right turn to come up on your right. If you are going right stop in the right turn lane or the right portion of the straight lane in the absence of a right turn lane. If you are going to make a left turn, stop in the left turn lane or the left portion of the straight lane in the absence of a left turn lane. If the lane is too narrow for a car to safety pass, you should take the lane (ride in the middle) to force the car to pull into the parallel lane to pass you. Do not ride on the edge of the road on narrow streets; that will encourage drivers to squeeze by you. Always move over as soon as it is safely possible to allow traffic to pass. This is the law if more than 4 vehicles are backed up behind you. Group riding: When riding in groups of 6 or more with traffic approaching from behind, it is wise to ride two abreast and in a nice tight formation. This prevents traffic from squeezing by you and also shortens the distance by ½ that the traffic has to travel in passing the group. Your safety comes first but courteous behavior is always a positive in sharing the road. Below is a simple diagram that will explaining proper thought process in bike lane use. Keep in mind the AZ law, statute 28-815 Riding on Roadway and Bicycle Path; Bicycle Path Usage. Eight riders completed the SCCC inaugural century. Left to right. Warren Smock,Yoshi Sano, Jerry Hansen, Teri Trollope. Our ride to Lake Pleasant! 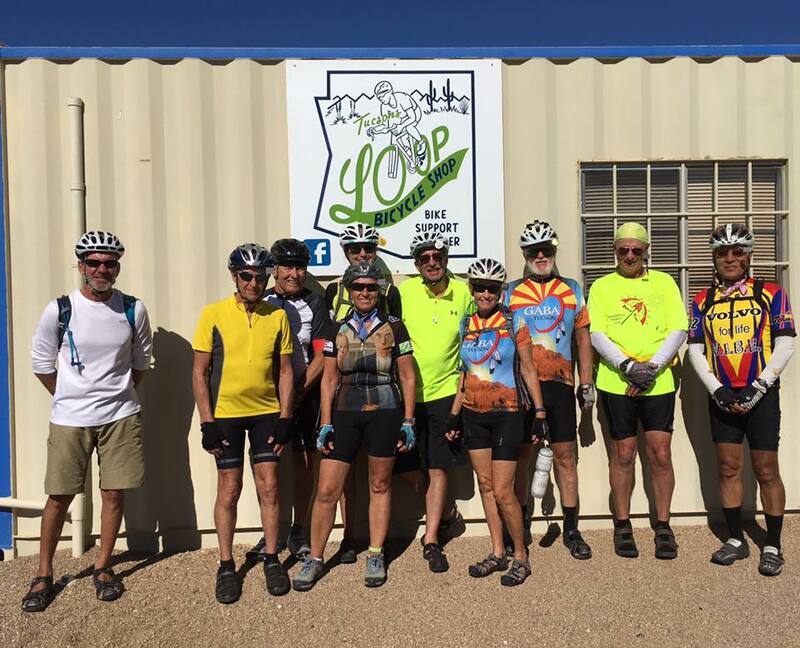 Sun City Cycling Club Chapter First Ride, Oct 2015. Original Sun City Bike Club in 1960! Fourth Tour de Sun City Christmas Lights Ride was a great success. We had 20 riders, a good time was had by all! Information on April 27, 2017 ride. The route will take us thru some lovely Scottsdale and Paradise Valley areas before picking up the trail from Scottsdale to Tempe Town Lake. We will return home via downtown PHX. right on 25th Ave. Complex is 0.5 mile on your left. turn left on 25th Ave. Complex is 0.2 mile on your right. The Booth’s will be providing lasagna and garlic bread Please bring a dish to share (appetizer, salad, or dessert) Also bring a gift for the gift exchange. Saturday, Dec. 16, 6th Annual Tour de Sun City Christmas Lights. Raise your voices and shout, Hallelujah! Hallelujah! one more time, Hallelujah! You are invited to the Sixth Annual Tour de Sun City Christmas Lights Ride. Join your friends and fellow cyclists for this holiday inspiring ride to put you into the spirit of the season. Plenty of parking on the street in front of my house. Bicycle parking in my garage in the back. the light displays; no one will be dropped. About 5 miles from the end we will enjoy the Grand Finale light display before returning to the end for refreshments. This should take about 2 hours. Refreshments: Coffee, hot chocolate and snacks at my house after the ride. We’ll meet at the picnic area for the lower Lake Mary off Lake Mary road. There is an $8 fee for parking there. There are restrooms there. You can also park along the side of the road before you get to the Lower Lake and ride up to the picnic area. There is a wide spot on the south side were people sometimes park. Make sure you are not in a no parking zone. It’s appx 145 miles from Sun City, so allow at least 2 1/2 hours to drive up there. Head up I17 and turn right onto Lake Mary Rd. the picnic area is 6.5 mile east from the freeway. The ride is 45 miles with 1600’ elevation gain. Food, water and restroom are available at the store at Mormon Lake. Lunch after at Susan & Chris’s in Oak Creek Canyon. If you are planning on this ride and coming to Susan's please RSVP at susan.shiring@gmail.com I will hand out direction at the ride. November 23, 2018 Black Friday Opt Outside Century. Breaking news regarding the Black Friday Opt Outside Century, November 23, 2018. John Patrou’s wife is going to provide a sag stop at approximately the half way point. Each rider can bring a small cooler or bag with their preferred lunch items and any other snacks they might need for the second half of the ride. Bring them to the start and she will transport them to the designated lunch stop. She will return the coolers to the start location for your pick up after the ride. This will allow us to keep stops to 5 minutes and the lunch stop to 15 minutes, critical for us to finish in 8 hours or under. 1. I generally go out slowly. 2. I intend to ride the Century in 8 hours including all stops and breaks. (Note: My last two Centuries last year took me 8 hours 15 minutes and 8 hours 30 minutes.) Do not expect a blistering pace. Questions contact me at warsmockren@hotmail.com. 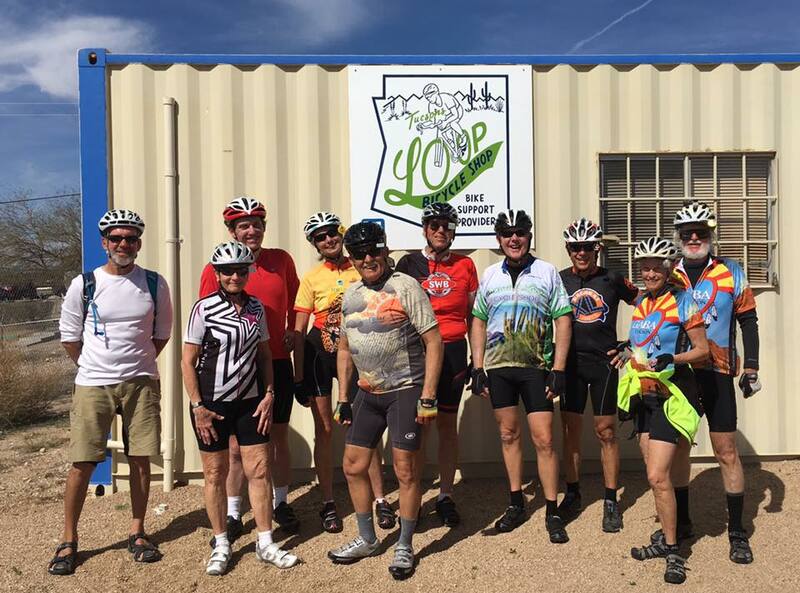 Thursday, February 21, at 9:30 a.m.
Roddy was a fixture to Sun City Cycling and Southwest Bicycling Clubs for many years riding several times weekly. His last year of cycling, he rode over 9,000 miles taking in the beauty of the landscapes and sharing his life with many cycling friends. 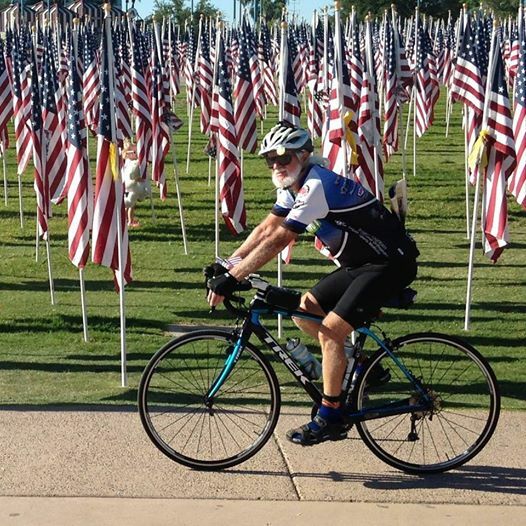 This memorial ride will begin at 9:30 a.m. at the home of Bruce Johnson and Doris Weber, 10523 W. Prairie Hill Circle, Sun City. The route will be approximately 40 miles and will conclude at the Johnson’s. At the conclusion of the ride we’d like to do a social and soup brunch so we ask you to bring your favorite soup to share with riders and Roddy’s friends who will be attending. Your soup can be dropped off at the start of the ride so it can be plugged in and kept warm. Tableware and beverages will be furnished. If you have any pictures of Roddy, be sure to bring along. Stories involving Roddy will be welcomed. We believe some of Roddy’s family will be with us after the ride to reminisce and to meet some of Roddy’s biking family. Please RSVP by February 15th by texting Bruce Johnson at 480-825-8814 or sending an email to Bruce at bej91050@msn.com. It is always difficult to see a good friend pass away. It is always a blessing to share the wonderful times we have had with our friends. We hope you can come and share with Roddy’s friends some of our memories we have had with such a wonderful man, Roddy Adams. Bruce Johnson has put this together to honor Roddy. Hope you can all make it. This is a three day two night self-supported tour of southeast Arizona. 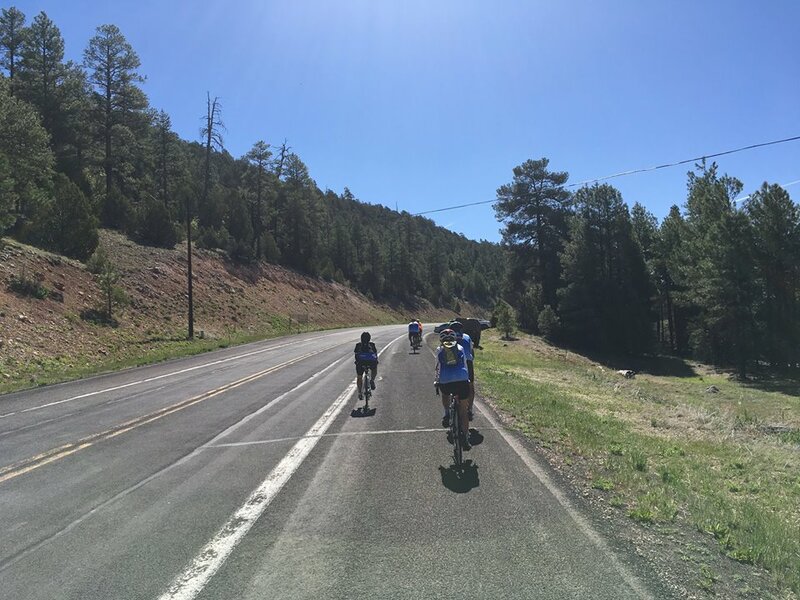 We will depart Benson, AZ at 10 am on Wednesday, February 27 and cycle to Sierra Vista. Overnight at the Comfort Inn. 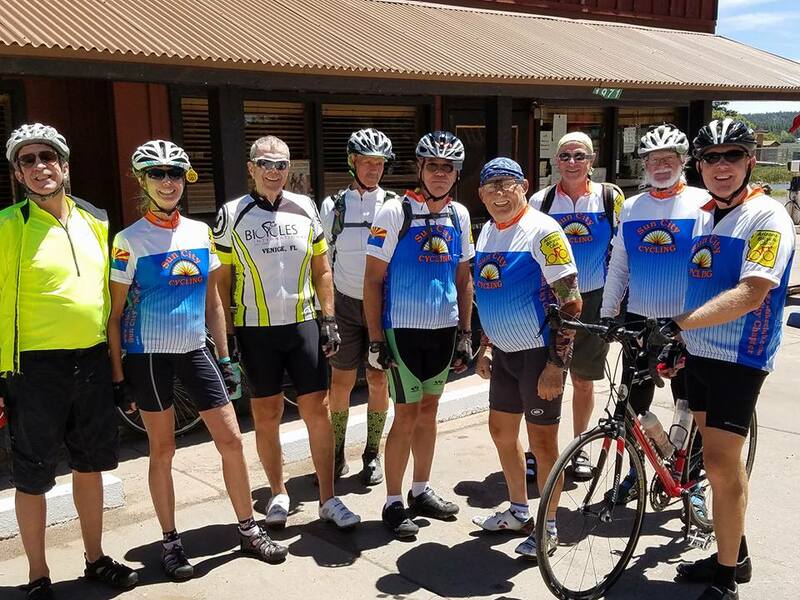 Thursday, February 28, 2019 we leave Sierra Vista and cycle to historic Bisbee, AZ and overnight at the historic Copper Queen Hotel. 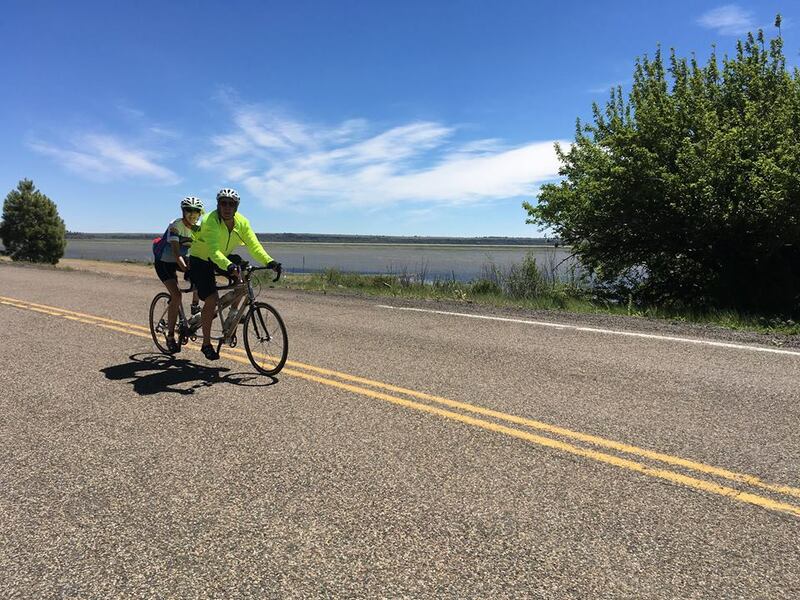 Friday, March 1, 2019 we cycle back to Benson and depart for home. Hotels: You make your own reservations. Wednesday, February 27, 2019, Comfort Inn, 3500 E Fry Blvd, Sierra Vista, AZ 85635. Phone 520 459 0515. You are responsible for all charges. I have a block of rooms on hold until February 15, 2019. 6 rooms with two double beds at $89.00 + tax. Call to make your reservation at 520 459 0515. Group name is Sun City Cycling and the rooms are in my name, Warren Smock. When you make the reservation they will change it over to your name. Contact person is Nicole Snyder. Thursday, February 28, 2019. Copper Queen Hotel, 11 Howell Ave, Bisbee, AZ, 85603. Phone 520 432 2216. Call to make your reservations at 520 432 2216. Group is Sun City Cycling. Contact person: Ask for Dave, the manager and best to call Wednesday through Friday. Note: There may be better rates on the internet but make sure you check out the number and size of the beds. If you are sharing a room the above rates are pretty good. Routes: Detailed route instructions and map will be available at least the week before. Generally we will cycle approximately 40 miles the first two days and up to 55 miles on the last day back to Benson. 1. Looks like we will have a limited support vehicle to carry our luggage. 2. Everyone is responsible for their own expenses. 3. Please notify me when you make your hotel reservations that you plan on going. 4. I will email you the routes and additional information as needed.